Artisan POS now integrates with the popular Magento Community Edition, Zoey, WooCommerce, and Shopify Shopping Carts. These are available from numerous hosting companies, so you are not tied to one company or developer. There is a whole community with everything from inexpensive, customizable templates to consultants and large consulting companies that work with these products. 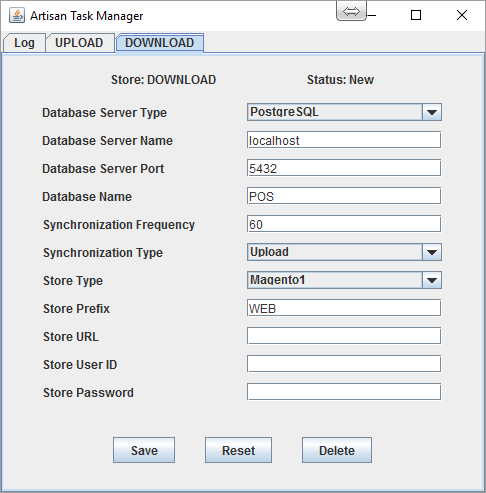 Artisan will automatically synchronize its database with the web store database. You can create items and categories in Artisan and specify which ones are to be sent to your web store. Artisan will even post the product pictures for you, along with shipping weight, extra descriptions, etc. Artisan can also pull down orders from your online store for completion. The biggest benefit of this option is that you only have one inventory list to maintain instead of a list in Artisan and a list in your web store. The shopping carts have a complete Content Management System (CMS) that you can use to edit other pages on your site to provide information about your store, such as directions, hours, and anything else that is important to your business. Zoey and Magento limit the size of attribute set (variant template) and attribute names, and do not allow special characters except the underscore. If the sum of the lengths of an attribute name and its set name exceeds 28 characters, it will be truncated, so it is a good idea to shorten any long variant template or attribute names before beginning. After Magento is installed, install the Bubble Extension from https://github.com/jreinke/magento-improve-api/downloads. To install the extension, first, download it, unzip it, and then FTP the contents to the Magento directories of the same names. Sign on to the administrative panel. In the side menu, select Services->Magento Core API. Turn on WS-I Compliance and save the changes. Go to System->Web Services->Soap/XML-RPC – Roles. Add a new role named admin. On the “Role Resources” tab, set access to “All” and save the changes. Go to System->Web Services->Soap/XML-RPC – Users. Create a new user using attributes of your choice. Note the user name and API key (password), as these will be used later. On the user role tab, select “admin”. Save the changes. Note: You must have Java 1.7 or later installed in order to use the Zoey interface. Go to Advanced -> API Configuration. Under Standard API, click on “API Roles”. Click on “Manage API Roles”. Under “Role Resources”, select “all”. Under Standard API, click on “Manage API Users”. Add a new user using attributes of your choice. Note the user name and API key (password), as these will be used later. Under “User Role” select “admin”. Under Standard API, click on “More Standard API Options”. Click on “Manage API Settings”. Set “WS-I Compliance” to “yes” and click on “Save Config”. Click Advanced -> Cache & Index. Set Automatic Store Refresh to “Yes” and click “Save Config”. Our WooCommerce interface requires WooCommerce version 2.6 or later. In the WordPress control panel, add a user named Artisan, and make it an administrator. Go to WordPress Settings > Permalinks, and turn on post name permalinks. Go to WooCommerce > Settings > API. On the Keys/Apps tab, add a key for user Artisan with read/write access. Copy the Consumer Key and Consumer Secret for later use. Add shipping zones, shipping options, and shipping classes if you haven’t already. Set the time zone to match your local time zone. From the dashboard, click Apps -> View Private Apps -> Generate API credentials. In the Description field, enter Artisan, and change all of the permissions to “read and write”. For those that don’t provide that option, select “read access”. Click Save. Save the API key and password for later use. Add shipping and payment options. Web store synchronization is performed by the Artisan task manager, which schedules each synchronization task according to a frequency that you specify. There must be a context parameter for each synchronization function: The example has two context parameters: “upload” will upload inventory data to the web store, and “download” will download order data from the web store. If more than one store needs to be synchronized, you must specify context parameters for each store (with unique names). The first time the program runs, click on each task tab, complete the profile, and save it. Each task will then be automatically scheduled to run with the frequency that you specified. 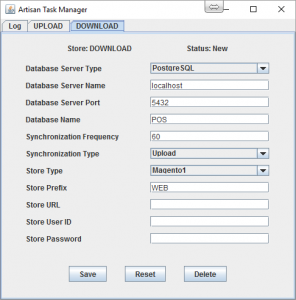 Database Server Type – the Artisan database type (e.g., PostgreSQL). Database Server Name – the network name of the database server (“localhost” if on the same computer). Database Server Port – the server port number (5432 is the Artisan default). Database Name – the name of the Artisan database, in upper case. Synchronization Frequency – the frequency with which to synchronize the web store with the database, in minutes. Synchronization Type – “upload” to upload inventory data, “download” to download orders and customer records. Store Type – type of web store (Magento1 = Magento Community Edition). Store Prefix – a string used to prefix the ID of each record downloaded to differentiate it from those created locally or from other web stores. Store URL – the web site address of the web store, starting with “https”, and without a trailing slash. Store User ID – the web service user name created above. Store Password – the web service password created above.